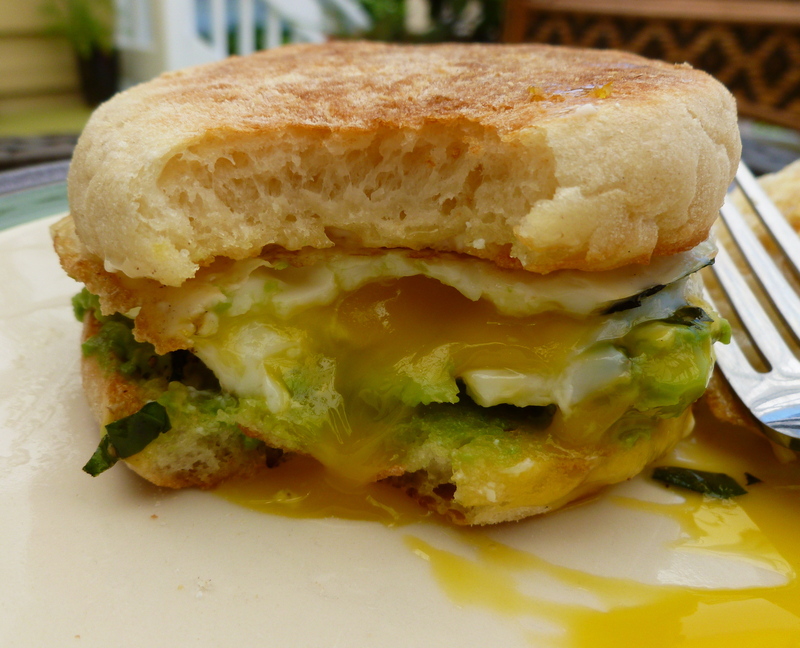 Basil and avocado add a twist to an egg breakfast sandwich. This is an easy recipe, perfect for one person. Wondering what to do with that fresh basil from the garden or the bunch you picked up from the farmer’s market? Some think of using basil for Italian dishes like pesto and caprese, which is great, but there are so many other ways to use basil. When I think of basil, I think of breakfast. I created this breakfast sandwich because it’s easy to make and perfect for one person. And if you have a morning visitor, it’s just as simple to make two of them. I combined basil from my garden with one of my favorite foods – avocado. As a single gal, I usually have two avocados on hand. I recommend you buy one that’s soft and ripe and another that’s very firm. That way, every couple of days you’ll have an avocado to play with in the kitchen. I justify my love of the avocado with the fact that it is a heart-healthy food with monounsaturated fat and potassium. Now if only we could grow avocados in the Pacific Northwest. I know you’ll find this breakfast sandwich rich and satisfying. For me, it was the perfect weekend breakfast on my warm, sunny porch. Add basil to egg as it is frying in the pan. 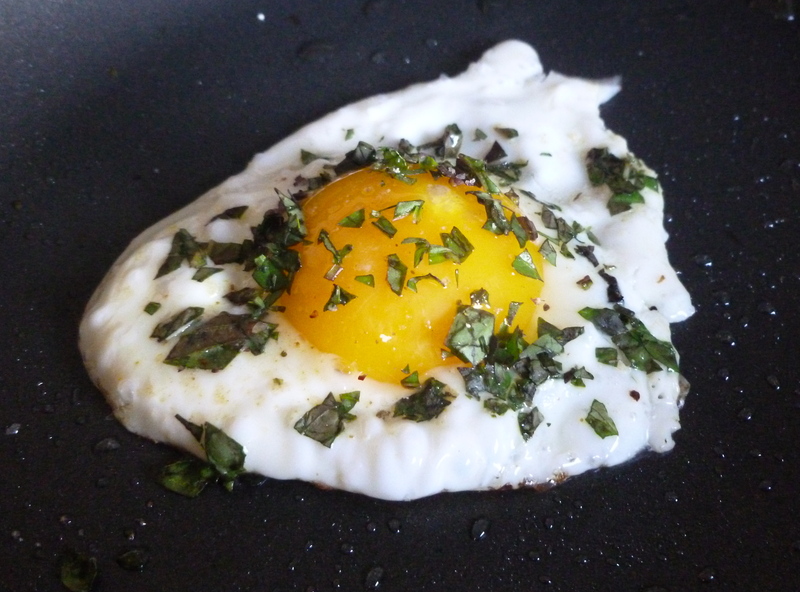 As you fry an egg in coconut oil, sprinkle chopped basil on top. Add salt and pepper. As egg is cooking ‘sunny side up,’ toast muffin slices. Spread mayonnaise on one slice of toasted muffin. Mash slices of avocado on the other slice of muffin. Place medium cooked egg in between slices. Posted in Recipes and tagged avocado, basil, breakfast, breakfast sandwich, egg, recipe, sandwich. Bookmark the permalink. Congratulations, Christine, on your new blog and love the recipes! Right now I’m preparing fava beans that came in my CSA box yesterday. Growingwashington.org had a link on how to prepare them + recipes, see: http://well.blogs.nytimes.com/2011/06/17/making-fava-beans-a-favorite/. Great pic Christine! I believe you will be making two breakfast sandwiches when I come to visit. This looks yum-o I’ll have to try it! Pics look great!